Charlotte Stevenson is inspired by An Afternoon with Lauren Child. ‘The more you look at things, the more extraordinary they become. An image really can change the world’. 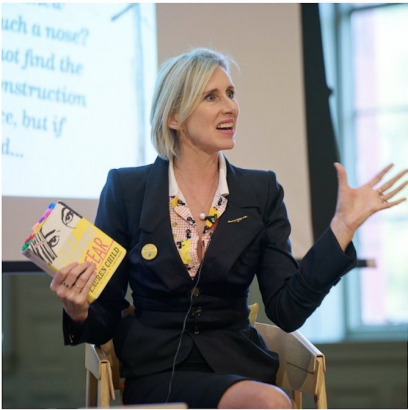 These are the words that have reverberated with me the most from the Manchester Literature Festival afternoon with current Children’s Laureate, Lauren Child. To celebrate the recent release of her book, Hubert Horatio: How To Raise Your Grown-Ups, Lauren entered into conversation with fellow writer/illustrator, Candy Gourlay, about all things literary. What ensued was something Ruby Redfort might define in her survival guide as a Q and A with a twist; an hour outside of time where ‘you can never be completely sure what will happen next’. Candy and Lauren together made for an iconic duo, discussing the ins and outs of successful children’s writing, and how to render stories even more exciting with imagery. Walking us through many of her characters and their stories, from Clarice Bean and The Princess and The Pea to the soon to be released Mary Poppins, Lauren provided a great deal of insight into not only her own creative process but what we should all be aware of as readers and writers alike. ‘The way things are laid out can really help you read’ she said, analysing her use of different type faces on a page of a Charlie and Lola book. The type used is as such that, whether or not you can read, the ‘very words become a part of the image’ and it’s possible to get an idea of what these characters sound like. That use of the image as the main medium of communication, despite the many different uses of layers, images and overall themes of her writings, is a style that remains uniquely Lauren’s no matter the experimentation with format. This common thread weaves throughout in what members of the audience described as equally distinctive as creatives such as A.A. Milne and Lewis Carroll. Whilst it was fascinating to gain insight into how Lauren is able to piece together fragments of her experiences into her creativity, and to gain background information about the entire process of titles I grew up reading, the best part about the afternoon was how engaging it was. As Lauren spoke, Candy always had a joke to share to which Lauren would have an equally hilarious anecdote. From discussing her and her sister’s adventures growing up, to overhearing a small child saying ‘this football smells of olives’, Lauren’s own experiences are equally as fascinating as her books. Which makes sense as they are, after all, inspired by her own encounters. The main thing I took away from this event is that children’s literature is at a really exciting turning point. There is so much creativity going into it at the moment and with Lauren as the current Laureate, encouraging young people to really engage with reading in new and different ways, the next generation of readers is definitely in safe hands. And on that note, I will leave you with some extremely good advice that was shared towards the end of the event and which I think summarises who Lauren is and what she does beautifully: The best thing you can possibly have is a sense of yourself; you just do things the way you do them.